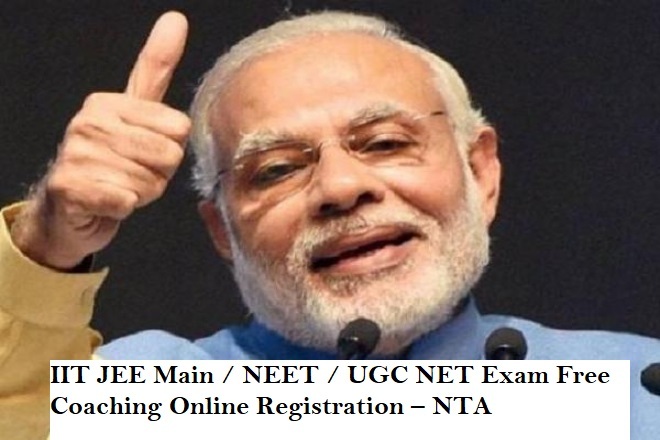 In 2019, Modi government has planned to provide free coaching facilities to the candidates who would be preparing for competitive exams such as NEET, UGC NET, IIT JEE Main and others. For the online coaching, online registration would be made available to the candidates and after this the candidates can attempt the online test series. In addition to this, NTA or National Testing Agency would conduct entrance examinations required for admission in higher academic institutes. Start Date: It would change 2,697 practice centers into important teaching centers for the betterment of the students. It has further been decided that the practice centers would begin from the 8th of September. In addition, the government also has stated that it would not charge any fees. The meritorious students from all areas would be encouraged to take part in these practice centers that do not have the required money to attend paid coaching classes. By this method, the government would be able to identify talented students and help them to prosper more in their future. National Testing Agency would make arrangements such that students can attend mock test examinations in January 2019. As of now, the mock test would be allowed only for JEE Mains with the expectation that this mock test service would be extended for UGC NET and other exams as well. With the help of NTA mentors, after the completion of Mock tests, the candidates can analyze the results of the same with mentors and accordingly they can get to know about their performance. However, the registration of the online free coaching class would start from the 1st of September 2018. In order to attain the mock series, the students have to apply for the online registration either through a mobile application or by visiting the official website of the online coaching centers. The test would be made available only for the registered candidates. After the results of the mock tests, the students can attain interactive sessions and clear all doubts with their mentors. The time duration of the exams, the dates of the exams and other relevant information would be put up on the official website of the same. Since, the NEET-UGC exam is a pen and paper-based examination, the online mock series of the same has not been initiated yet. Both the mobile application and the website would come into being from the 1st of September 2018. This initiative has been launched by the government such that they talented but poor students can be helped to pursue the career of their choice with the help of these practice centers and the crack the competitive exams. Also, this step by the government would prove to be a big hit to the private institutions who are offering coaching classes at a much higher rate. The main aim of the government is to help the poor students of both the rural and semi-urban area.